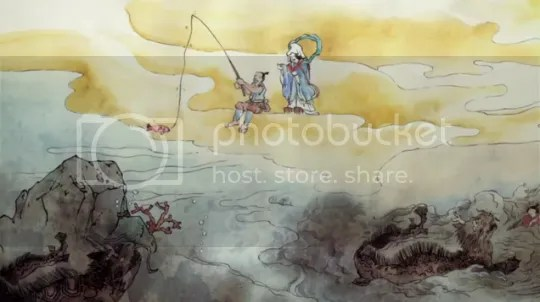 While DUCK’s leader plans to shoot JFX down with a missile, Akira grows uneasy and just wants to fish JFX out right away. However, Tapioca convinces him to gather some help from his friends, so Akira does so. 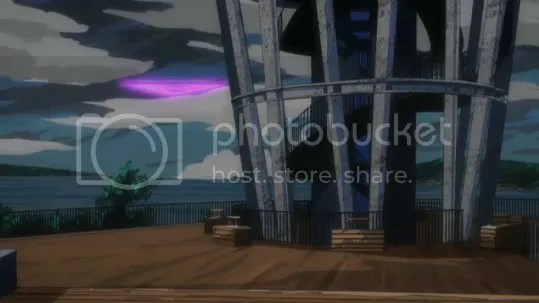 After gathering Natsuki and some of the other Enoshima residents, they outline a plan to get back into Enoshima and get the gear they need to fish JFX out of the sea. 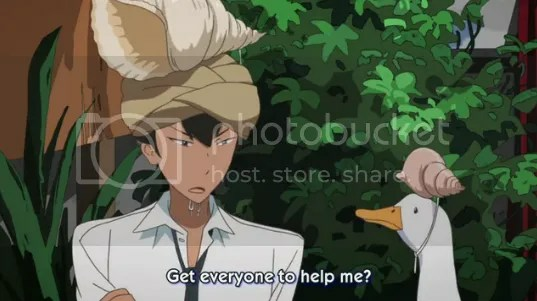 Nevermind the fact that they’re wearing shells on their heads… Akira can UNDERSTAND what his duck is saying! 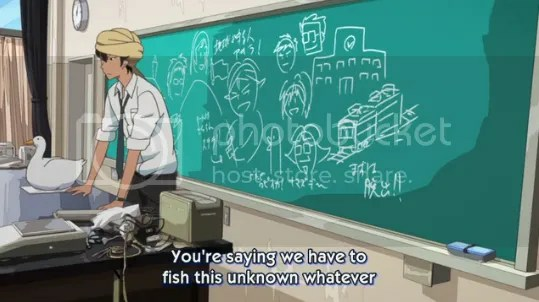 Did Akira draw that stuff in the background? Meanwhile, Yuki is also successful in getting back into Enoshima, thanks to the help of a kind taxi driver. After meeting up with Natsuki (who helps to distract some DUCK guards), Yuki meets up with Haru, who is drying out because all the water lines have been cut to Enoshima. 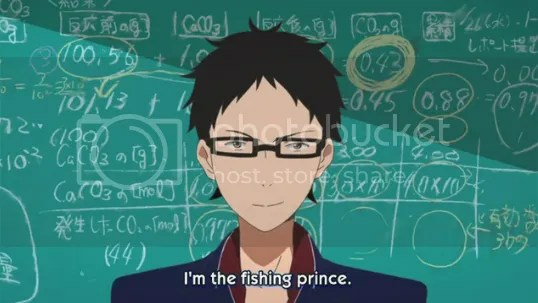 It is here that Haru finally tells Yuki everything: about why he’s here, why he wanted Yuki to learn how to fish, and what he really is. After Haru and Yuki reconcile, Haru reveals that, should they catch JFX, he’ll have to return to his home planet. This episode is great and my summary doesn’t do it justice. One of the more emotional Tsuritama episodes we’ve had, packed in with plenty of plot. This is NOT an episode you’d want to miss. I absolutely loved the teamwork that was shown here. It’s really touching to see them all working together, but even more so because it was Akira who leads them. Akira “I don’t need friends” Yamada. 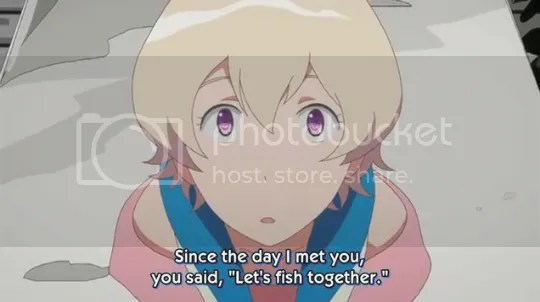 More touching moments includes Natsuki finally calling Tamotsu “dad” again, and Yuki and Haru’s meeting. Can I just say that I love nearly everyone in this series? Because that’s mostly true for the Tsuritama series. The animation seems a tiny bit higher quality than usual, for obvious reasons. 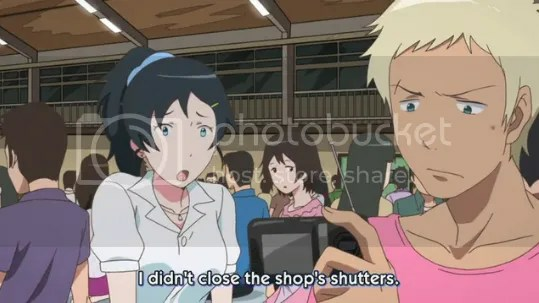 But Tsuritama does still have a few problems with scenes where the characters move really fast. It’s a little jarring because of how noticeable it is, but by now that’s pretty much normal for the series. Hopefully the quality issues are cleaned up in the blu-ray releases. To end this review, I’ll talk about that WHAM ending. Since Koko’s been confirmed (by Haru) to still be alive, the ending of episode 10 might mark the first “character death” in this series. I have doubts that our dear Captain is actually dead, but we’ll have to see what happens in the next episode!